Goal: The objective is for the child to acquire automatic knowledge of the print=sound relationship in order to develop correct phonologic processing of print necessary for proficient reading. #1 Is actually looking at the printed letter(s). Chanting the sound while looking at you or the ceiling is not sufficient. Be sure the child had direct eye contact with the actual printed letter when he is saying the sound. Even better is to have the child also finger track left to right under the letter as they eyeball the printed letter and say the sound. #3 Repeatedly practices the sound until the print=sound knowledge is automatic. Direct practice and drill with the printed letter(s) = sound can be accomplished with a variety of fun age appropriate games. 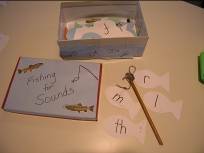 · “Fishing for Sounds”: Cut out index cards or cardstock in the shape of fish. Write the letter(s) on the fish. Your child ‘catches’ the fish. If they know the sound they can keep the fish. See how many fish they can catch. You can even make a ‘fishing pole’ with a stick, string and paper clip or small clothespin. · “Catching Sound Butterflies”: Cut out the index cards or cardstock in the shape of butterflies. Write the letter(s) on the ‘butterflies’. 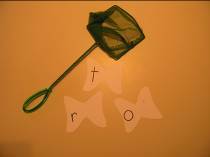 Give your child a small goldfish net and let them ‘catch’ the sound butterflies. They can keep the ‘sound butterflies’ that they know! · “Collecting Sound Cars”: Cut out the index cards or cardstock in the shape of cars. Write the letter(s) on the cars. The child collects the sound cars when he says the correct sound! · “Herding Sound Horses”: You guessed it! 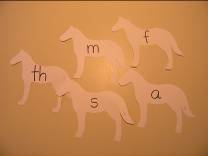 Cut out the index cards in the shape of horses. The child sees how big of a horse herd she can round up. All she needs to do to herd a horse is to say the sound correctly! She can even collect her herd in a her ‘corral’ or ‘barn’. · Make a “Go Fishing Card Game”. Write the sounds on the cards. Have the child ask “do you have an /__/” (say the sound). For example “Do you have an /s/?” No, go fish! Yes, hand it over! · “Stack the sounds” . Turn the tiles over. Have the child pick a tile up. When the child knows the sound, he can keep the tile. See how high he can build his stack. · “Sound Memory”: play the traditional memory game except the child needs to match sounds. Every time he turns over a tile, he must say the sound. When he locates the matching sounds he can keep the set. · “Sound Bingo” : Make bingo cards with 3x3 or 4x4 grids with the letter(s) your child needs to practice written on the squares. Then call out the sounds (not letter names). For example, do you have /s/, do you have /m/, do you have /th/..etc. Use the ‘sound tiles’ or make ‘bingo chips’ with the letters printed on them. The child must find and match the correct ‘sound tile’ or bingo chip to the correct bingo square. AND of course the child must always say the correct sound! 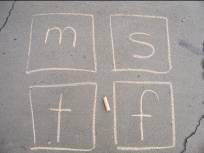 You can even go outside and play ‘sound hopscotch’….. All you need is an energetic child and some sidewalk chalk! Explanation of Why These Direct Print = Sound Practice Activities are Effective: The simple activity of having the child say the correct sound while looking at the printed letter(s) effectively establishes the direct print=sound relationship (grapheme=phoneme). This includes the multisensory processes of visual (see the printed letter), oral (say the correct sound) and auditory (hear the correct sound). The variety of games allow for fun ways to encourage the necessary practice and repetition that insures automatic knowledge of the printed letter=sound relationship. These simple, low-cost activities are highly effective in helping children learn the direct print=sound relationship necessary for proficient reading. If a child does not automatically know a sound, have them practice it a few more times. Practice and repetition builds the automatic knowledge that is important to proficient reading. In addition, remember, highly effective activities do NOT need to be expensive. These effective activities can all be made at home at minimal cost. IMPORTANT NOTE: Knowledge of the phonetic code (print=sound) is absolutely necessary for proficient reading. 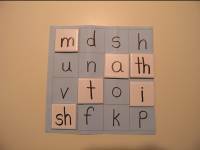 See the article “Building Blocks of Written English:The Phonemic Code Explained”. However, knowledge of the phonetic code alone is not sufficient for reading. Reading is a complex process. To establish phonologic processing of print, the foundation for reading success, the child must develop additional skills in phonemic awareness, blending, tracking, attention to detail, knowledge of the complex code and learn how to integrate and apply these skills. See the article “Skills Necessary for Proficient Reading” for additional information. While knowledge of the basic sounds is an essential start, an effective complete direct systematic phonics program is still necessary to insure your child acquires proficient reader skills. Additional free information on teaching students to read is located at Reading Information and Information & Resources for Teaching Reading pages of the Right Track Reading website. Enjoy reading with your child! “What Sound Is It?” - Sound Identification Games: This can be done with children first developing phonemic awareness to both practice the print=sound and to develop necessary phonemic awareness. Say a word that starts with one of the sounds. The child identifies the beginning sound and then points to the correct letter that starts the word. (For example lay out the tiles for ‘m’, ‘s’, ‘i’, and ‘th’. Tell the child a word like ‘sit’. The child then recognizes the beginning /s/ sound and points to the ‘s’ tile. You then say the word ‘mom’ and the child says /m/ and points to the ‘m’ tile. As you can see, teaching with carefully targeted direct instruction activities absolutely can be fun. You can use you imagination and come up with variations that your child enjoys. If he likes basketball, write the sounds on paper ‘basketballs’ and let him ‘dunk’ the sounds he says correctly. As long at the child is directly looking at the accurate printed letter(s) AND saying the correct sound the activity effectively teaches your child the necessary print=sound relationship. Have fun with your child! Flash card practice: You can make a set of simple flash cards with the letter(s) written on an index card. While not as flashy as other ‘games’ this drill is enjoyable for young children as they can ‘show off’ how many sounds they know! This straightforward practice is also appropriate for older students.